Represented by the Scales of Justice, Libra is a sign of equality and harmony. A full moon in Libra encourages us to seek balance in our life and avoid the kind of self-sacrifice that disrupts that equilibrium. On this full moon, focus on being at peace with yourself. Because Libra is represented by the scales, my representation of the sign was fairly easy. I borrowed this from my covenmate Andrea because it was perfect for this altar. I then worked this the gold as a sign of justice and positivity, adding in hints of red for self-love and partnership. The red accents were present in two ways, the first of which was the Justice tarot card. What better way to represent Libra then utilizing the exact symbolism of the sign from the Swiss 1JJ Tarot deck? To highlight this theme of balance, I placed a black candle on one side and a white one on the other. These items were contained within the "moon" mirror that I've utilized on the previous altars. 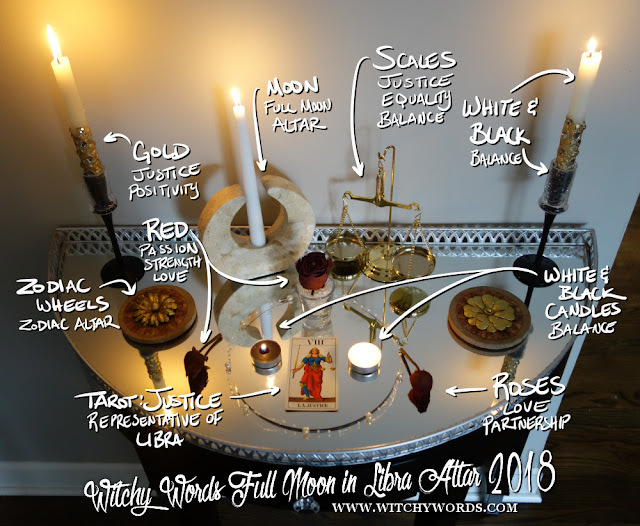 A full moon in Libra represented with Libra on the full moon. The red accents were also created by placing dried red roses on the altar - two on either side of the moon mirror and one in a small cup above the Justice card. Roses symbolize love and partnership, emphasizing the self-love and internal balance theme of the altar. On a recent thrift store run, I discovered these adorable zodiac disks (they're likely coasters but I won't be using them for that purpose). These disks have the entire wheel of the zodiac circling a sun. Using gold flowers, I blocked the sun to represent the lunar nature of this altar. On either side of the altar, I placed pillar candles. Each candle was white with gold trim set in a black candle holder. This white and black dichotomy carried the continuing theme of balance while the gold accents tied it in with the justice portion of the altar. This dedication to the full moon in Libra is pretty straight-forward in its symbolism and interpretation. I'll likely be continuing this pattern for future altars. Enjoy!